This is a post I recently shared on Chic Galleria, but I wanted to make sure I shared it here too! This is a family favorite around Thanksgiving and Christmas. It's torture waiting for it to come out of the oven, and then when it does it goes fast! Since there's so much other food to go around, though, there's usually enough for breakfast leftovers... like really good french toast. But better. Rinse and dry yams and potatoes. Slice all into 1-inch wide disks, then slice the disks into sixths or fourths. You should have a pile of rough cubes when finished. Slice the small bread loaf into similarly-sized pieces (cubes about 1 inch.) Set aside. 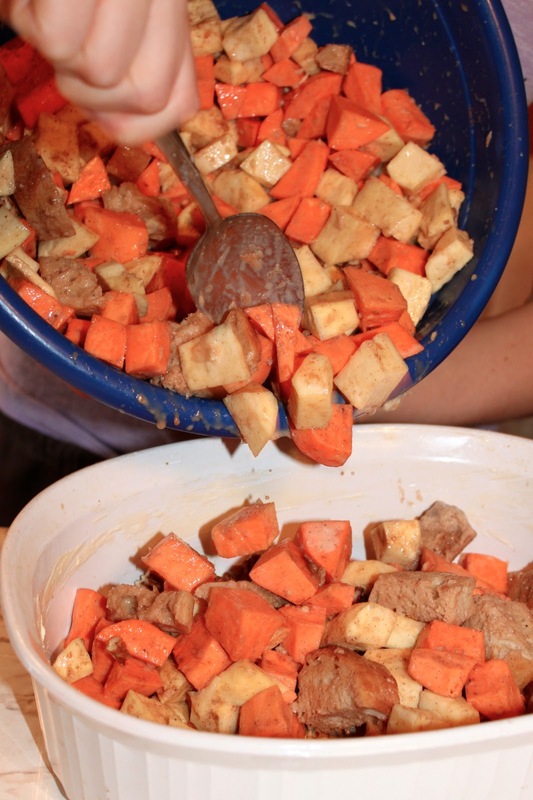 Put all yam, sweet potato, and bread cubes into a large mixing bowl. In a smaller bowl, combine cream, orange juice, and spices. Mix well. Pour cream mixture over ingredients in large bowl. Add brown sugar and pecans. Turn with a large wooden spoon to coat evenly. Transfer contents of bowl into prepared baking dish. Add thin slices or "dots" of butter over the top of the baking dish contents. Gently pour 1/4 c. water over the ingredients, to add moisture. Cover dish with foil. Place in middle rack of oven and cook for 1 hour and 15 minutes, or until yams and sweet potatoes are tender. Serve hot with vanilla yogurt, whipped cream, or ice cream!